I'm with you Kat….. Maple syrup is divine! I have never seen maple sugar before though….. I wonder if you can get it over here? I imagine the flavour is quite unique?! I've never seen it in the shops before, if I ever see it I'll let you know! Maple and pecan danish is my favourite so I'm sure I'd love these squares. 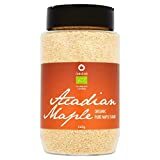 I've never seen maple sugar in the shops before, I'm going to have to keep and eye our for it as I'd image it has a lovely flavour. Oh if you like those danishes then you'd love these!